Former Wigan Athletic footballer Marlon King has been released from jail after serving time for sexually assaulting a woman in a London club. 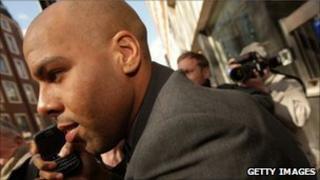 King received an 18-month sentence at Southwark Crown Court in October 2009. His agent Tony Finnigan has vowed to find a new club for the 30-year-old striker. King's former chairman at Wigan, Dave Whelan, who had said King should never play football again, claimed he has now forgiven the player. At the trial last year at Southwark Crown Court the jury heard King groped and punched a 20-year-old woman while out celebrating his wife's latest pregnancy at the Soho Revue Bar. His victim, who jurors heard had "repeatedly cold-shouldered" the footballer, was left with a broken nose. King was found guilty of sexual assault and causing actual bodily harm. Mr Whelan said on Thursday: "He's served his sentence, I'm sure he's learned a lot and I forgive him and I wish him well if he gets back into the game. "I was very upset at the time, but I really think you've got to forgive people because we all make mistakes and if he can get back into the game, good luck to him." Mr Finnigan said: "I've spoken to people in football and I'm asking for interviews, and I'm asking clubs who may have been interested in the past to sit in the room with this person and interview him. "As of now, I can't sit here and lie to anybody and say we've got a team." King, whose former clubs include Nottingham Forest, Watford, Middlesbrough and Gillingham was on loan from Wigan to Hull City when he sexually assaulted the woman in December 2008.